The fund and KSE100 have experienced considerable decline in value during last one month. Uncertainty regarding imposition of Capital Gain Tax on stock investments has been one of the major reasons for selling by local investors in the market. One of the many reasons why the fund kept under performing KSE100 during this all period is the absence of OGDC in my portfolio. ODGC is the largest company listed in Karachi Stock Exchange and has above 20% weight in the KSE100 index. There has been a lot of buying of OGDC mainly by foreign investor during the last one month which lead to considerable increase in the price of OGDC. Although all research analysts in the leading brokerage houses had either a sell or hold call on OGDC, the stock kept appreciating owing to foreign investment in the stock. This lead to an upside bias in the KSE100 index during this period while most of the stocks in the index were declining in value. If we exclude the weight of OGDC in the calculation of KSE100 index return, the index performance adjusts downwards. This is due to the fact that KSE100 index is based on market capitalization and OGDC represents above 20% of total market capitalization of KSE100. As of 4th June 2010, OGDC’s market capitalization was Rs5.8bn against Rs24.7bn market capitalization of KSE100. Due to this, the performance of KSE100 is quite biased towards performance of ODGC. 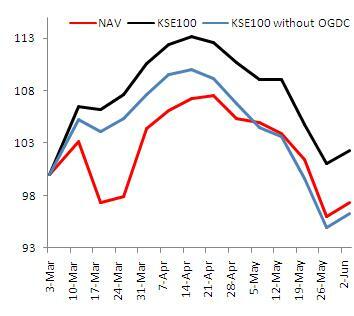 If I exclude OGDC from the KSE100 index, the fund outperforms index by the end of May.Within portfolio, some stocks in textile industry are under performing primarily due to their unliquid nature. My strategy is to sell these stocks on their June’10 results. The fund and KSE100 performed by 0.3% in the week. I have increased my exposure to manufacturing sector to 17% of the portfolio after buying Agriauto industries. There were not much movements in my portfolio during the week. My portfolio has 16% cash left now. With results season coming ahead, I might do some churning to take advantage of certain mispricings. The fund and KSE100 performed by 2% in the week. I have increased my exposure to textile sector to 25% of the portfolio. Though one of the holdings is risky investment, but I expect a good quarterly announcement for this 1QCY10 for that company. I have reduced my exposure to upstream oil and gas sector to 22% as well as I find limited upside in those stocks. Moreover, I have sold the under performing financial sector stocks. All of them were Closed ended funds, trading at 50-70% discount to NAV. I expected them to rebound but they under performed KSE100 during the last 6 months. I have identified a stock in automobile sector which I expect to have around 20% upside from current levels. I might invest the remains from the sold off securities into that stock or consumer goods segment. Wateen’s IPO is coming next week but I am strictly keeping it off my fund owing to fundamental reasons which I will explain going forward in my other post. I expect market to remain range bound in coming week owing to overvalued valuations. Fund outperformed KSE100 by 3% during the week. I have tilted the fun to bit risky investments during this week with increase in my textile exposure. Currently I have 27% cash left in my portfolio. Highest exposure of 37% is to Oil exploration sector, 16% to textile, ans rest of it in financial, chemical, Industrial goods and cement sector. My plans for next week is to pick up some more stocks from consumer goods and paper sector which are fundamentally significantly undervalued for now. My dividends will be credited to my account next week which will pick up the NAV as well. My fund under performed KSE100 during this week. KSE100 performed really well during the week owing to foreign buying in OGDC. Since I had no exposure to OGDC in my fund, the fund under performed on the upside. However, the fund performed really well when the market was falling. I bought or sold nothing during the week from my portfolio. If I were allowed to invest in the Banking sector, I would have bought National Bank due to the fundamentals.